When it comes to clay, Brit Nick Park is your man. He is responsible for the hugely popular Wallace and Gromit and Shaun the Sheep, all of whom are fashioned together out of bits of coloured clay and painstakingly brought to life using the all time consuming process known as stop-motion animation. It has its rewards though, as he’s won a myriad of awards including four Oscars and five Baftas for his work. 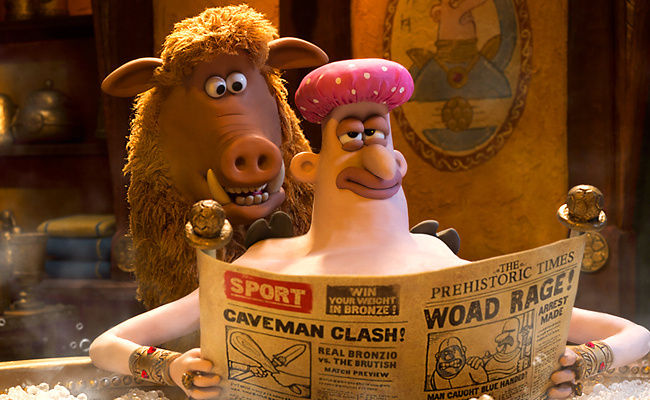 For his latest project, Park steps a little out of his creature comforts zone, bringing a new but old world to life in Early Man. Oh no, the reviews are in. God they smell. Way back when, at a time where wearing loin cloths were the biggest trend, lived caveman Dug (Eddie Redmayne). He lived within a small community of cave people in a valley, along with his pet boar Hognob (Nick Park). Whilst out hunting one day, they are set upon by a brash gang led by Lord Nooth (Tom Hiddleston), who declared that there time was up and that the Bronze Age had arrived. Somehow by mistake, Dug ends up in the back of one of their carts, and is taken back to their city. He’s then mistaken for a football player and ends up on the pitch, in goal, during a big game in front of a huge crowd. Once he’s found out, he decides to challenge Nooth’s best team, Real Bronzio, to a match where if Dug’s team won, they would be allowed to stay in the valley safely. Nooth agrees, only on the condition that if they lose, they will all be sent down to work in the mine. So for Dug’s bunch of amateurs, it’s very much game on. Do you think I'm happy about this? I'm related to the great Morph for crying out loud?! 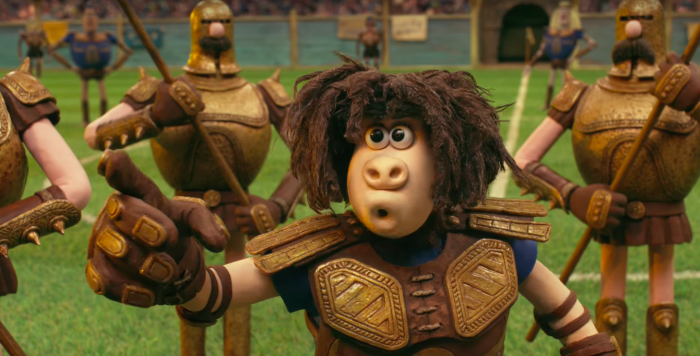 There feels something inherently wrong in disliking a Nick Park project; his films to date have been charming and cheerful, put together with the utmost love and affection. So it is with a huge amount of sadness to describe this effort as an abomination in clay. The story is embarrassingly generic, completely devoid of any imagination. Boy comes good on the footie pitch is truly treading on tired ground, and setting in prehistoric times doesn’t help any. The characters are, for the most part, limp and dull, making it difficult to care whether they win or not. There’s also the character Goona, voiced by Game of Thrones Maisie Williams, who delivers such a painful accent to listen to, where two accents from two different continents have been strangled into submission to blindly merge, that the only way to stop it is to stick your fingers in your ears. Overall, its primary audience feels like those who are sat in front of CBBC’s to distract them for a while, giving parents the time to get on with their lives, however briefly. This is hugely disappointing because up until this point, the Nick Park experience could not only be easily shared, but also enjoyed amongst adults on their own. Also, it may be timely to feature football, what with a rather big tournament only moments away, but it doesn’t lend itself to a great sporting spectacle in clay. Something like the Olympics however, with numerous events and disciplines would have been far more fun. And if anyone dare comment on the fact that the Olympics would hardly have been around at the period of history, it’s fairly unlikely that football tournaments were kicking around during this time either. With all the incredible hard work that goes into producing this type of animation, it’s disappointing to be so critical on the end result. But a bad film is a bad film, even if it’s made out of clay. Not the model film that was hoped for then; looks like Park will have to go back to the cave wall drawing board.